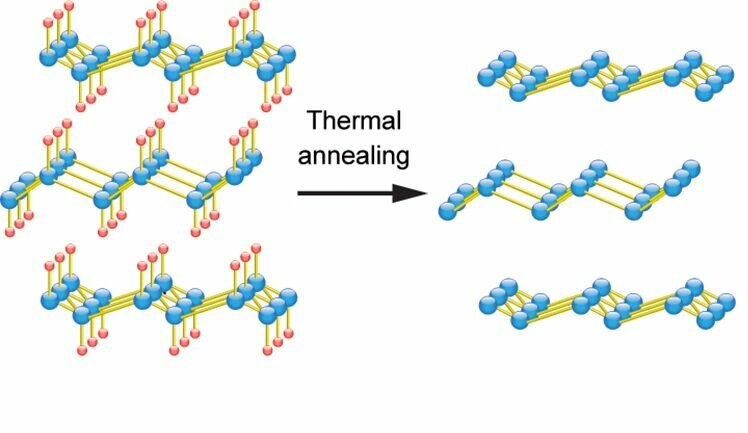 Germanene is a 2-D material derived from germanium and related to graphene. As it is not stable outside the vacuum chambers in which is it produced, no real measurements of its electronic properties have been made. Scientists led by Prof. Justin Ye of the University of Groningen have now produced devices with stable germanene. The material is an insulator, and it becomes a semiconductor after moderate heating and a very good metallic conductor after stronger heating. The results were published in the journal Nano Letters. Materials of just one atomic layer are of interest in the construction of new types of microelectronics. The best known of these, graphene, is an excellent conductor. Materials like silicon and germanium could be interesting as well, as they are fully compatible with well-established protocols for device fabrication, and could be seamlessly integrated into the present semiconductor technology. "But the 2-D version of germanium, germanene, is very unstable," explains University of Groningen Associate Professor of Device Physics Justin Ye. Germanene is made from germanium by adding calcium. The calcium ions create 2-D layers from a 3-D crystal and are then replaced by hydrogen. These 2-D layers of germanium and hydrogen are called germanane. But once the hydrogen is removed to form germanene, the material becomes unstable. Ye and his colleagues solved this in a remarkably simple way. They made devices with the stable germanane, and then heated the material to remove the hydrogen. This resulted in stable devices with germanene, which allowed the scientists to study its electronic properties.